The Hyams Foundation is proud to partner with grantees in Boston and Chelsea in the pursuit of social justice and lived equality for all. One of the important racial justice issue areas the Foundation focuses on is expanding fair wages and benefits. Here are three efforts our grantees have been involved in. As national awareness and discourse on income inequality peak in this election year, Community Labor United (CLU) – a coalition of community and organized labor groups and activists – is making headway in addressing wage theft, a contributing component of the growing inequality in Massachusetts. According to Darlene Lombos, CLU’s executive director, in a recent opinion piece in CommonWealth Magazine, “Wage theft can take many forms – paying below the minimum or average rate, failing to pay overtime, or by misclassifying workers as independent contractors. Even when workers are promised a specific wage, in many cases there are few legal protections to ensure that businesses actually pay employees accordingly.” Click here to read Darlene's opinion piece. As a part of the “Good Jobs Strong Communities Campaign," efforts are underway to reign in the increasing misclassification and misuse of outsourcing and multilayered subcontracting by large companies to distance themselves from the responsibility for the wages, benefits and work conditions of those doing the work. In its report, “Gaming The System,” CLU found that 59% of Massachusetts employers in 2014 did not offer health insurance with the rationale that “most of their employees were part-time, temporary, and/or contracted employees.” The report states that one in seven employers underreported or misclassified workers as independent contractors, costing the state $259 million in payroll taxes and $87 million in unemployment insurance. Click here to see the full report. Click here for an in-depth Q&A with Darlene Lambros and learn more about CLU's advocacy work and the role of communications in it. 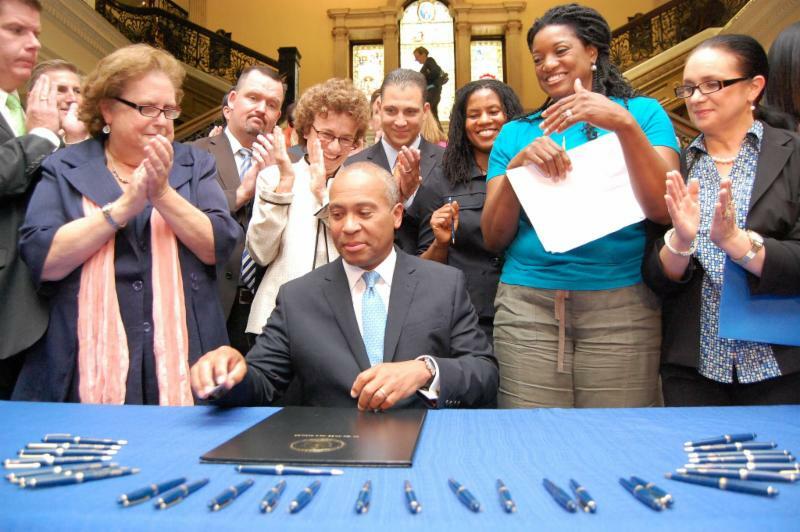 Former Massachusetts Governor Deval Patrick signed the Massachusetts Domestic Workers Bill of Rights into law on July 2, 2014. Photo courtesy of Genesis Garcia. On April 1, 2015, a new law went into effect that strengthens the rights of domestic workers, who work in the fields of household management, housekeeping, cleaning, cooking, elder care, and childcare. This law ensures that these workers are protected in the areas of payment, lodging, termination, record keeping and other aspects of their employment. Given the unique nature of these jobs and the vulnerabilities these workers face, the Hyams Foundation has funded the Massachusetts Coalition of Domestic Workers to perform the equally important task of not only advocating for the legislation's passage, but of ensuring its implementation. More than a year out from this victory, the coalition is still actively educating not only domestic workers, many of whom are immigrants and people of color, but also their employers about the new law. While it's important that workers know their rights, the coalition also collaborates with employers to ensure that these rights and responsibilities are acknowledged and fully executed. From 2008 through 2011, the Foundation supported a small number of organizations in the asset-building area, including the MIDAS Collaborative, in coordinating the Massachusetts Asset Development Coalition. The coalition researched and proposed a set of institutional and policy changes, including recent increases in the scale and impact of the state Earned Income Tax Credit (EITC). Building assets—savings, a car, a home, educational and employer-recognized occupational skills—can help families attain economic stability and well-being, weather an unexpected financial crisis, or come-up with funds to invest in education and training. However, many families face policy and institutional barriers to building these assets. Following completion of a report by MIDAS, “The Massachusetts Debt Trap: How Private Debt Buyers are using the Courts to Hurt Families," policymakers have taken up its recommendations, including S146/H4194, the proposed Family Financial Protection Act, which would increase consumer protections by allowing a fair and transparent way for families to repay their debts. The bill passed in the state Senate; the House has not yet acted. Current laws allow out-of-state lenders to file court cases with large wage garnishments, often containing inaccurate information on the debtor, and high fees, as is documented in the MIDAS report.